If you use Spring framework for more than a week you are probably aware of this feature. Suppose you have more than one bean implementing a given interface. Trying to autowire just one bean of such interface is doomed to fail because Spring has no idea which particular instance you need. You can work around that by using @Primary annotation to designate exactly one "most important" implementation that will have priority over others. But there are many legitimate use cases where you want to inject all beans implementing said interface. For example you have multiple validators that all need to be executed prior to business logic or several algorithm implementations that you want to exercise at the same time. Auto-discovering all implementations at runtime is a fantastic illustration of Open/closed principle: you can easily add new behavior to business logic (validators, algorithms, strategies - open for extension) without touching the business logic itself (closed for modification). So far so good, but only first test passes, can you guess why? Interestingly, even though Spring internally injects LinkedHashMap and LinkedHashSet, only List is properly ordered. I guess it's not documented and least surprising. To end this introduction, in Java 8 you can also inject Optional<MyService> which works as expected: injects a dependency only if it's available. Optional dependencies can appear e.g. when using profiles extensively and some beans are not bootstrapped in some profiles. Thanks to @Primary we can simply autowire StringCallable everywhere as if there was just one bean while in fact there are multiple and we inject composite. This is useful when refactoring old application as it preserves backward compatibility. Nothing wrong so far, except the class name. But what happens if one of the StringCallables has a dependency on it? Is there an unresolvable circular reference? By decoupling bean creation from injection (impossible with constructor injection) we can now create a circular dependency graph, where Caller holds an instance of Fifth class which references Enterprisey..., which in turns references back to the same Caller instance. Cycles in dependency graph are a design smell, leading to unmaintainable graph of spaghetti relationships. Please avoid them and if constructor injection can entirely prevent them, that's even better. Spring framework first loads Alpha and tries to instantiate a bean. However when running getBeansOfType(Beta.class) it discovers Beta so proceeds with loading and instantiating that one. Inside Beta we can immediately spot the problem: when Beta asks for beanFactory.getBeansOfType(Alpha.class) it gets no results (). Spring will silently ignore Alpha, because it's currently under creation. Later everything is as expected: Gamma is loaded, constructed and injected, Beta sees Gamma and when we return to Alpha, everything is in place. Notice that even moving getBeansOfType() to @PostConstruct method doesn't help - these callbacks aren't executed in the end, when all beans are instantiated - but while the container starts up. getBeansOfType() is rarely needed and turns out to be unpredictable if you have cyclic dependencies. Of course you should avoid them in the first place and if you properly inject dependencies via collections, Spring can predictably handle the lifecycle of all beans and either wire them correctly or fail at runtime. 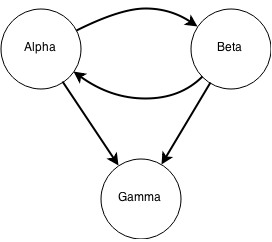 In presence of circular dependencies betweens beans (sometimes accidental or very long in terms of nodes and edges in dependency graph) getBeansOfType() can yield different results depending on factors we have no control over, like CLASSPATH order. PS: Kudos to Jakub Kubryński for troubleshooting getBeansOfType(). I couldn't make list injection work, because I forgot to put @Component on the implementation. The fact that this setup worked with injecting a single element (without collection) confused me even more. The first part of the post really helped me to sort this out. Thanks! Thanks for this! I forgot the annotations as well.